We are manufacturer of Brass Electrical Components such as copper bonded earthing rods, grounding rods, copper brass line taps split bolts split connectors battery terminals, electrical brass components brass fitting, electrical accessories electrical components, brass adapters conduit adapters brass connectors, brass clips brass clamps brass components, brass battery terminals, copper battery terminals, battery connectors, brass neutral links earth blocks neutral bars, brass parts, brass pins plug pins electrical brass pins brass stainless steel push on hose, brass terminal blocks. With the constant support of experienced professionals, we are fulfilling the varied needs of the valued customers by offering optimum quality Brass Electrical. The offered products are dimensionally accurate, resistant to corrosion and provide a high level of sturdiness and durability. We offer these products to our clients in several specifications and at market leading prices. Clients can avail from us high-quality Brass Electrical Parts. We made these parts using the finest brass and modern technology. 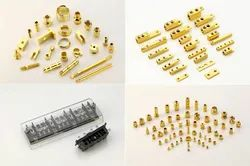 These parts are known for the optimum performance and used in electrical appliance components, lock brass parts and electrical connectors. Apart from this, we offer these at the best price possible within committed period of time. By keeping track of latest market demand, we are passionately involved in offering a large collection of Brass Switchgear Components. The offered components are quite sturdy, resistant to corrosion and have a long life. Further, the component is effective in a number of mechanical products. Made available in a number of specifications at the best price possible, the demand for these components is quite high. With the help of well-qualified professionals, we have stood at a top position in the industry by giving a broad array of Brass Connector Pin. Known widely for resistance to corrosion and long life, these pins are highly acclaimed. The offered product is designed under the supervision of skilled professionals using high-grade quality material and cutting-edge technology in tune with set industry standards. 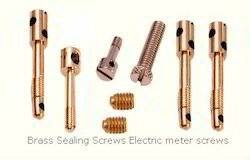 We are counted amongst the leading manufacturers and suppliers of this Brass Sealing Screw. Its high resistance to corrosion, dimensionally accuracy, strength and long life is owed to the fine raw materials that are used in its making. Further, we provide this screw in a number of sizes and at a very competitive price. Used for the purpose of commendable fastening, the screw is one of the first choices in the market. This Brass Riveting Terminal provided by us in the market is known for the high level of efficiency and effectiveness it provides in a number of mechanical industries. Manufactured in compliance with the set industrial norms, its quality is always maintained. Owing to the high grade brass used in its making, the offered product is highly resistant to corrosion and has a long life. 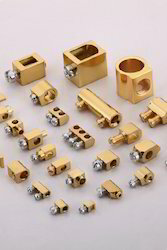 We are manufacturers from Jamnagar of various types of electrical connectors Brass strip connectors. All our wire strip connectors inserts for connectors are threaded with Go and not go maintain. Brass connectors, wire strip connectors, and brass single pole threaded wire strip connectors can be developed and supplied exactly as per customer specifications and bespoke designs. We are manufacturing all kind of electrical brass connector and electrical wiring accessories for many applications. We produce components as per customer’s requirement which change accordingly customer application. We are offering brass wire strip connectors. being one of the most renowned brass connectors exporters in india, we aim to provide high tensile products at most economical prices. We offer wide range of bras connectors such as brass wire strip connectors and brass single pole threaded wire strip connectors. Our products are available in specification up to 5 amp to 25 amp. They are made up of materials such as free cutting brass is 319 type (i) or bs 249 type (i) or high grade. Besides, we can provide any special bras material composition as per the requirement of clients. 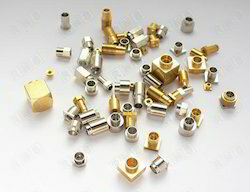 Our brass electrical connectors are served in various finishing and coating like natural, and nickel plated, tin plated. We can develop all kinds of customized products as per client specification. 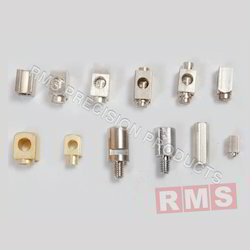 natural, nickle plated, tin plated brass connectors, brass wire strip connectors, and brass single pole threaded wire strip connectors or any coating as per customer specification. 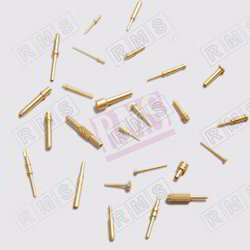 any kind of brass connectors, brass wire strip connectors, and brass single pole threaded wire strip connectors can be developed and supplied exactly as per customer specifications. We are supplying the Brass contact terminal for wire strip connector, modular switches, PCB Contact, switchgear components. we can supply as per customers drawing and samples. Natural, Nickel Plated, Tin, Silver Plated or any coating as per customer specification. We are manufacturer and supplier of a wide assortment of Brass Electrical Pins. With extensive application in electrical works, our pins are widely acclaimed for their durability and finish. Manufactured using high grade quality certified brass; these pins ensure rust proof quality. Post manufacturing, all these Brass Electrical Pins are tested by our quality experts to ensure the client gets a flawless product. 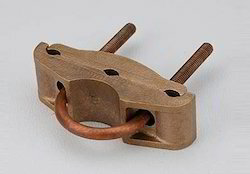 Brass Wire ground clamps are manufactured from high quality Brass material. We can supply as per customers drawing and as per customers specification. 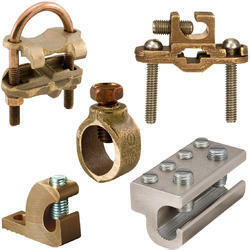 We manufacturing Brass Earth clamp as per customers drawing and as per customers samples. Ideal for being used in dry indoor conditions, the offered Brass Cable Gland is one of the finest that is available in its league. The raw materials used in its making make it a highly demanded product. 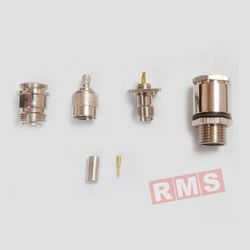 This cable gland is offered to the clients in varied sizes and at a best price possible. The level of functionality the cable gland provides is highly commendable.